Books can be ordered online by registering in our website. 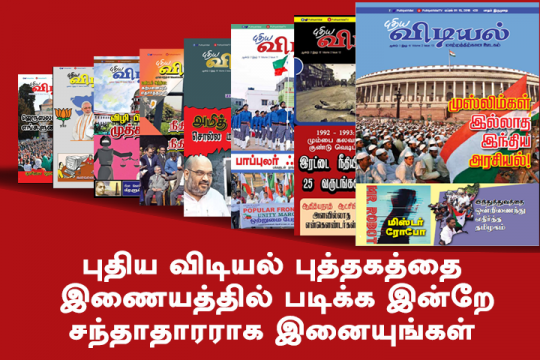 In case, the books your need is not in the list kindly use “தொடர்புக்கு” page to send your query to us. You cannot cancel any order and you will not be refunded for the same if the order has virtual items. You cannot cancel any subscription and you will not refunded for the same if the order has virtual items. You can cancel your order online before the product has been shipped. In case if you cancel your order we require you to call us (91-44-25610 969) and inform the order number which you need to cancel. If this is followed your entire order amount will be refunded. In case your product has been shipped but has not yet been delivered, Contact Us. Unfortunately, an order cannot be canceled in case a delivery has already been made. Once you request the cancellation of item(s) in your order, it will take us a maximum of 2-3 business days to cancel the order and initiate a refund. You will be notified of the same. Once the cancellation made, it may take up to 7-10 business days for the respective banks depending on your bank to process the refund. Please get in touch with the banks directly in case of any delays post confirmation of cancellation/refund by Puthiya Vidial. By visiting the website puthiyavidial.com, viewing, accessing or otherwise using any of the services or information created, collected, compiled or submitted to puthiyavidial.com, you agree to be bound by the following Terms and Conditions of Service. If you do not want to be bound by our Terms your only option is not to visit, view or otherwise use the services of puthiyavidial.com. You understand, agree and acknowledge that these Terms constitute a legally binding agreement between you and puthiyavidial.com and that your use of puthiyavidial.com shall indicate your conclusive acceptance of this agreement.